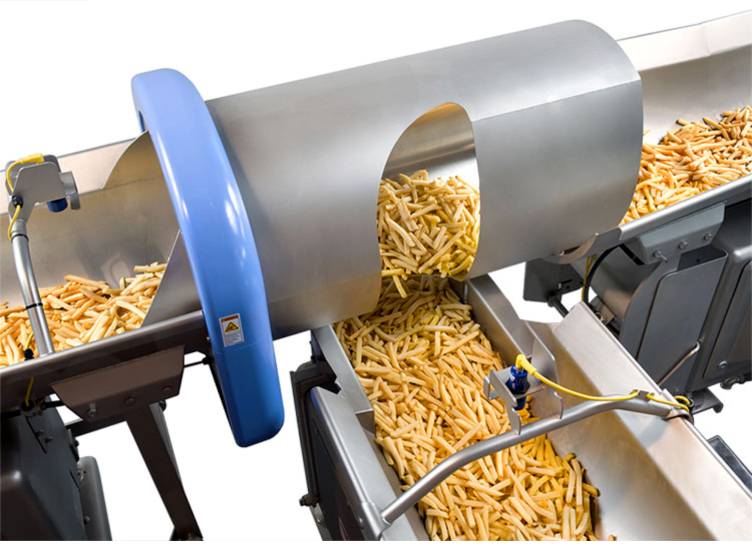 FastBack’s patented Revolution™ proportional discharge gate keeps the main product supply flowing as it allocates proportional amounts to individual weigher/bagger stations. Downstream stations are no longer “starved” or need to wait for product. Eliminating the product damage caused by “chopping” slide gates, Revolution’s cylindrical outlet rotates to divert a portion of the main product flow. No slide gates mean no product leaks, allergen risks or hazardous pinch-points. Air lines and pneumatics have also been eliminated to reduce maintenance. Revolution provides every advantage, plus the unbeatable performance of FastBack conveyors, which prevent product breakage, seasoning loss, and seasoning build-up in the pan! With slow-forward fast-back motion FastBack® conveyor systems safely convey even the most delicate products. FastBack® conveyers are easy cleaning. Coatings remain on product and don’t build up in the conveyer pan. There are no hard-to-clean areas on the drive base. Move over 60,000 lbs/hr (27 metric tons/hr) without bogging down. High drive accelerations deliver the benefits of horizontal motion conveying for products that previously could only be handled by vibratory conveyors. Patented modular belt drive has few moving parts and requires no preventative maintenance. Quickly replace drive and motor units without removing the pan or top cover. 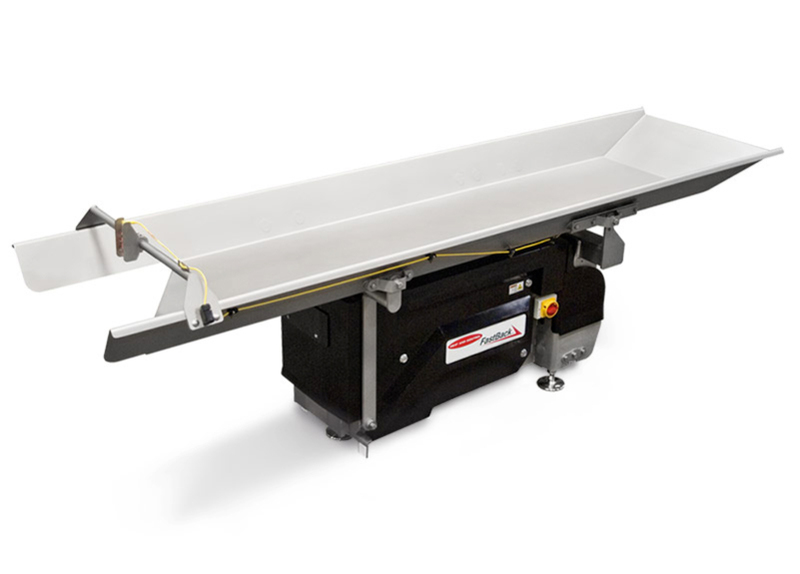 Gentle slow-forward fast-back motion safely conveys even the most delicate products with less breakage than vibratory conveyors. Expensive seasonings and coatings remain on your product. Maintain mixed blends of both dry and frozen foods. Size separation is eliminated because product moves by sliding instead of bouncing. Move over 60,000 lbs/hr without bogging down. As your plant expands, re-use the drive base with new pans. Low 70dB operation with product complies with stringent government regulations. 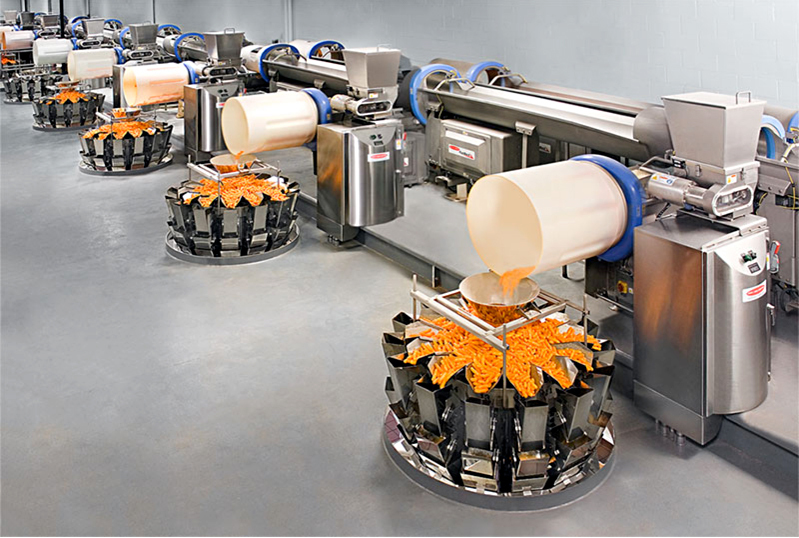 The compact FastBack 90E horizontal motion conveyor improves product transfer from distribution conveyors to high-speed multihead weighers for maximum packaging efficiency. The 90E is the ultimate scale feed solution – providing a full 360 degree radial feeder pattern to the scale and eliminating starved weigh heads caused by inadequate product flow or hills and valley’s. With one of the highest throughput values in the industry, the 90E has no trouble keeping up with today’s ultra high speed weighed bagger combinations. Use the same 90E drive base with different pan sizes to reduce costs for spare parts and layout changes. Pre-wired with all photoeyes and electrical controls integrated into its base, FastBack 90E is ready-to-run for simple installation. 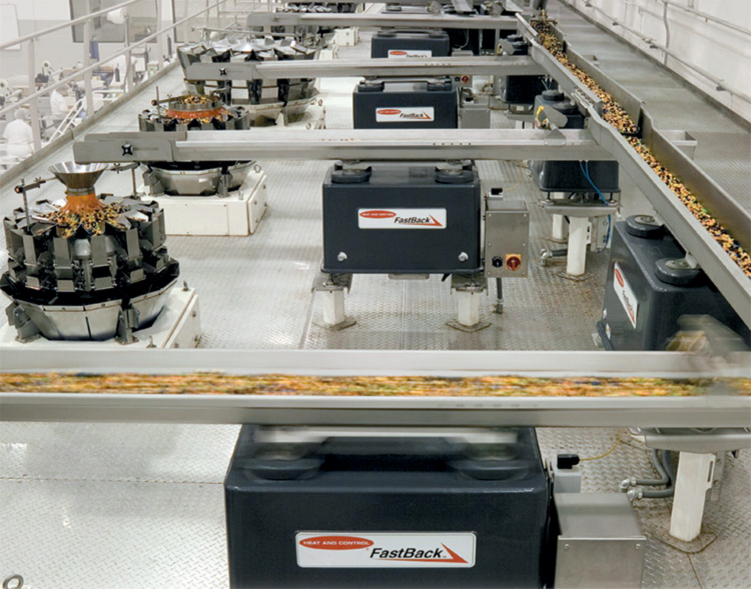 FastBack’s slow-forward fast-back horizontal motion prevents product fractures, breakage and loss of seasonings and coatings. Valuable coatings remain on products and do not build up in the conveyor pan. 70dB operation with most products provides a quieter working environment. With the smallest footprint on the market, 90E provides more access around the weigher. Its light weight also cuts support structure costs. Full 360 degree radial feeder pattern to the scale eliminates starved weigh heads caused by inadequate product flow. Instant stop-start optimizes product delivery. Patented Revolution Gate automatically proportions the correct amount of product flow based on the weigher’s requirements. Patented integrated conveyor and tumbling system eliminates product travel rate variations common to normal feed and tumble drum designs, and which play havoc with seasoning consistency. FastBack gentle handling and consistent travel rate, even with variations in product throughput, make consistent measuring and application possible. Options for product measuring include our patented FastBack measuring and our newest weight-based system, which is proving to be 8X more accurate than competitive systems. With hundreds of applications and a complete testing center to support your requirements, Heat and Control can bring the knowledge, experience and technology to your next project. Heat and Control supply to Techno Pak Fastback motion conveyor, all Ishida weighing and packaging system and CEIA metal detectors.